An innovative design and manufacturing company with ties to world-leading brands has moved in to a new £4 million base. 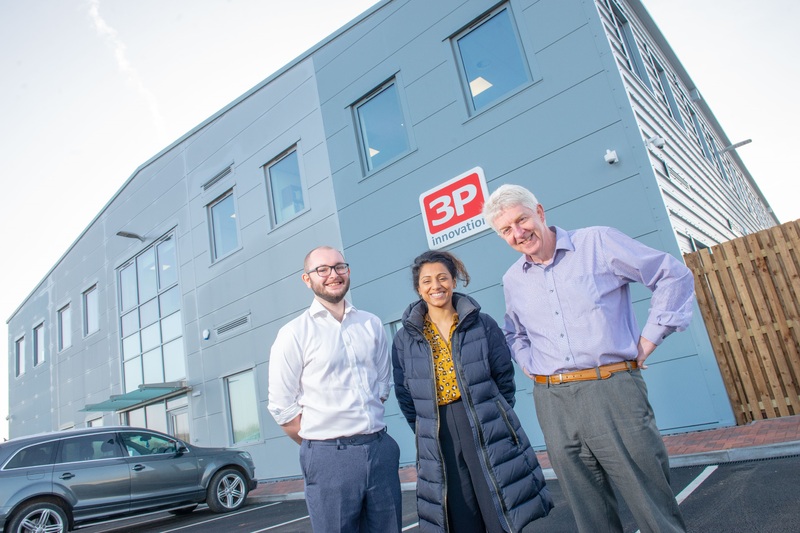 Engineering and process automation company 3P innovation has invested in a 30,000 sq ft purpose-built site at Tournament Fields in Warwick, which is more than twice the size of its previous home in Welton Road. As part of the move process, 3P innovation has worked with the Coventry and Warwickshire LEP Growth Hub and Coventry City Council in order to access grant-funding which has enabled the new building to work in as environmentally friendly a manner as possible. The move represents a major step forward for the company, which started out from a bedroom in 2006 and now works with global top 10 pharmaceutical, medical device, confectionery, personal care and household goods companies. Dr Geoff Vernon, Director, said: “This move has come at a crucial time for us and now we are settling in, all of the hard work feels worthwhile. “We had outgrown our previous site and needed to make this change to ensure we continued to grow, we had started to flat line due to space limits after growing every year from 2006 to 2016. “The move has given everyone in the company a boost and you can feel the positivity it has brought out in people. 3P innovation works with clients across North and South America, Europe and Asia who require assistance in developing and producing new high volume products to a high standard. The business offers a wide range of multi-purpose technologies and machine platforms as well as custom automation methods to fit any project requirement. Geoff said: “We want to be at the heart of innovation going forward and have plans to increase our product lines, as well as continuing with bespoke automation systems for clients. The business has worked with the Coventry and Warwickshire LEP Growth Hub’s account manager Jaymie Thakordas throughout the move and she will continue to advise them on growth going forward. Jaymie said: “3P innovation has a very exciting future ahead and this move to Tournament Fields is just the start. “Having a state-of-the-art purpose built facility will be a huge asset as the team press forward with new product lines and moves into new markets. Some £345,000 has been invested to provide the most advanced upgrades to improve the energy efficiency of the new site including solar panels to generate their own electricity. A £69,060 grant was provided for these upgrades by the Coventry and Warwickshire Green Business Programme, which was unlocked by the Coventry and Warwickshire LEP Growth Hub. 3P innovation applied for a grant from the Coventry and Warwickshire Green Business Programme which is part financed by the European Regional Development Fund and is being delivered by Coventry City Council, Coventry University and Coventry University Enterprises Ltd. The programme is open to businesses with fewer than 250 employees based in Coventry and Warwickshire. Sarah Watson, Green Business Delivery Manager said: “Going green is a change many companies will have to make sooner or later – and often all they need is a bit of support to help them. Warwick District Council’s portfolio holder for Business, Councillor Noel Butler commented: “We’re delighted to not only see this level of growth within 3P innovation but also that we’ve been able to facilitate further growth through our local support initiatives.